Puzzling question coming from an artist, and perhaps a bit pejorative using the verb throwing. Did Cezanne throw his fruit into place for his still life compositions? Perhaps your question is more about the setting of the still lifes. Winter's white blanket is a perfect setting for a watercolor still life. 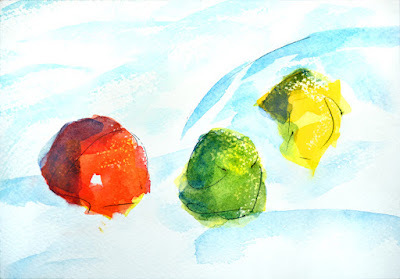 The white in watercolor is the white paper, a wonderful expanse, so snow is a perfect setting. The white and blue of snow simplifies the scene, focusing the eye on the color of the subject. I made this color observation years ago while shooting a children's book in Antarctica. Week after week, seeing only white and blue and gray, when coming upon life, the orange and red colors of a penguin's beak popped in this monochrome environment. One commenter wrote: "I love the richness and transparency of your colors... and the originality of your subjects!" M.P. Art reflects what the artist brings to a subject. I like to play with words, with visual elements. I had three successful books using my photographs as visual puns, Punography (Penguin 1978) featured in Life Magazine, Punography Too (Penguin 1980), and for children Puniddles (Houghton Mifflin 1982). So, fruit on snow isn't much of a stretch. It gives the viewer pause, and usually a smile. Why do I "keep" doing this. Why does any artist do what they do? I like playing with nature, a theme throughout my children's book career. I've always admired the art of the unique British artist Andy Goldsworthy (on Wiki HERE), how he plays with nature. I've been amused with watercolor sales. The fruit on snow motifs have sold more than other motifs. Who would've thought it? That's not why I paint them, but it's a pleasant surprising discovery, and feedback of a motif piquing a viewer's interest. FYI: These snow/fruit postings on my art blog include galleries of other artists' still fruit lifes which might be of interest.